Windows XP has reserved 10% of total hard disk capacity for the Recycle Bin by default. Ten percent might be considered very huge if based on today’s huge hard disks. For instance, on a 100GB hard disk, 10% works out to be 10GB. A total of 10GB reserved space for Recycle Bin might be too huge. We can actually change the percentage of the reserved space by right clicking on the Recycle Bin icon and selecting “Properties”. 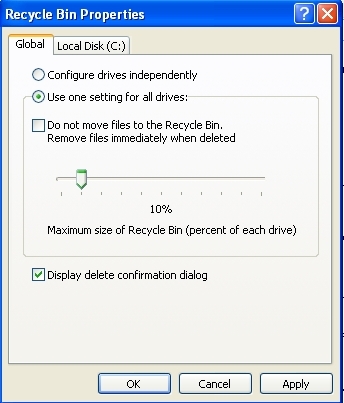 You can then amend the percentage of the reserved space for Recycle Bin used by all drives independently or globally.